The Uinta Mountains of Utah are out there. In North America they are the only major mountain range that runs east and west. 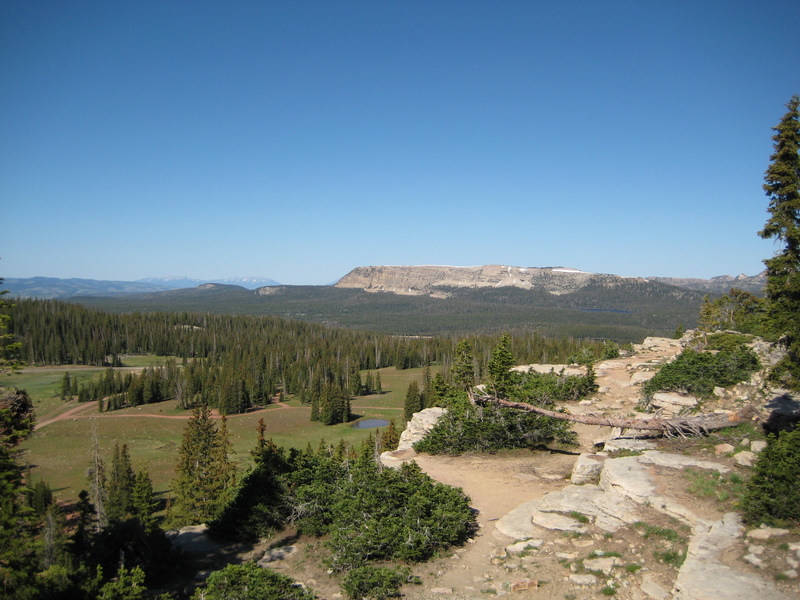 Mirror Lake Highway (WY/UT SR 150) runs northeast to southwest right across the Unitas, which involves some changes in altitude. We decided to go see. 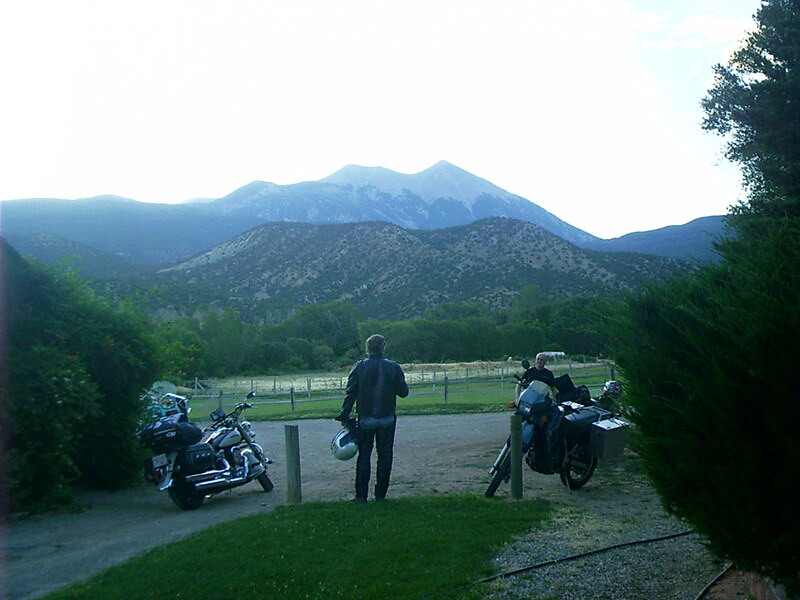 This is us — the Actual Riders of Reeky — who correspond via the Internet, particularly via the Actual Riders moderated discussion group and the rec.motorcycles Usenet newsgroup. 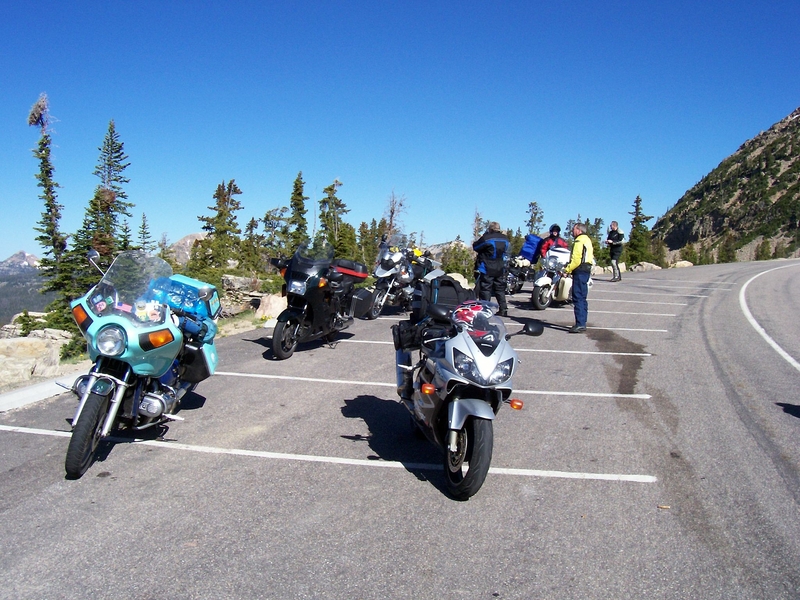 We met (most of us for the first time) in Evanston, WY, to ride the Mirror Lake Highway (75 miles) to Kamas, UT. From there we traveled UT SR 35 (70 miles) to Duchesne (pronounced doo-SHANE), UT, and US 191 (170 miles) south across the desert to Moab, UT. Toward the end of June it was pleasant in the mountains. In the desert it was hot! We had planned to meet at Kelly's Roadhouse Grill but found it had changed hands and Beartown had taken its place. Food was good. However, service was glacial because the place was packed, but we were in no hurry. More of us kept showing up to confuse the wait staff. A DVD of The Mountain Men (1980), playing through a projection set on the back wall, provided the required ambiance. This place is frequented by rafters floating down the Green. The cabins are not anywhere near the office. They're in a secluded spot. Fortunately we had good guides. 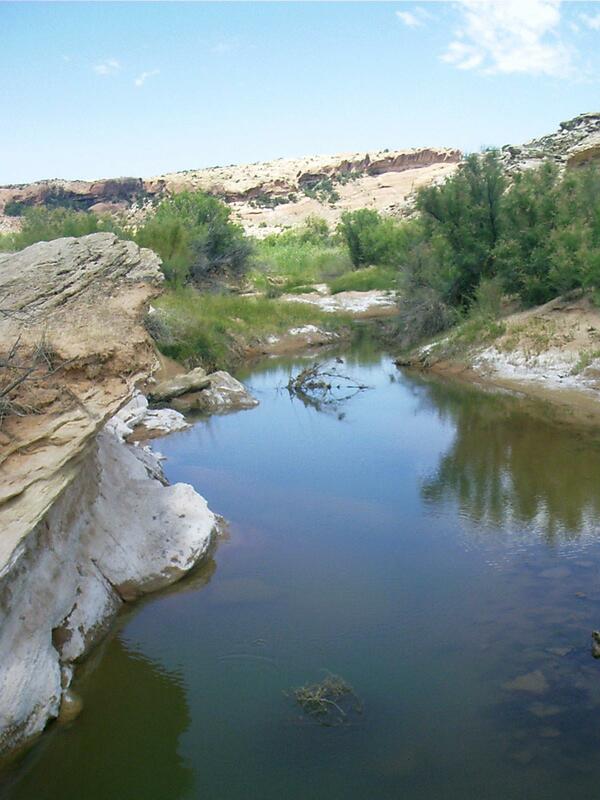 Pack Creek runs along the west side of the La Sal Mountains. The Spanish named them that because they resemble piles of salt. Thankfully in the evening a katabatic breeze off the mountains cools the valley. The cabins at Pack Creek are equipped with swamp coolers. There was a gas grill on the porch of one of the cabins, which conveyed the notion that we ought to raid the grocery in town for a cookout. 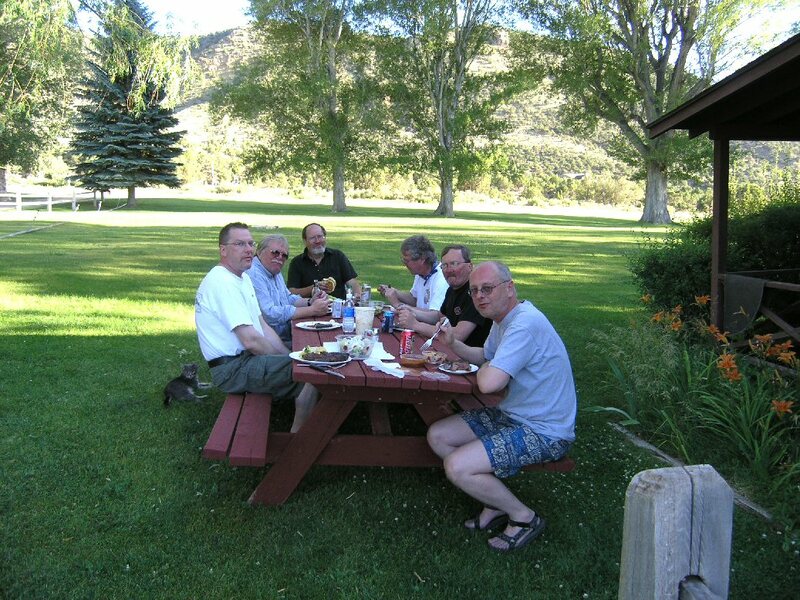 Here a few of us (Dexter the cat, Mark Olson, Don Binns, Chuck Rhode, Robb Cross, Tom "Sleazy" Mills, and Bryan Wooten) enjoy various cuts of roast beast on our second evening at Pack Creek. 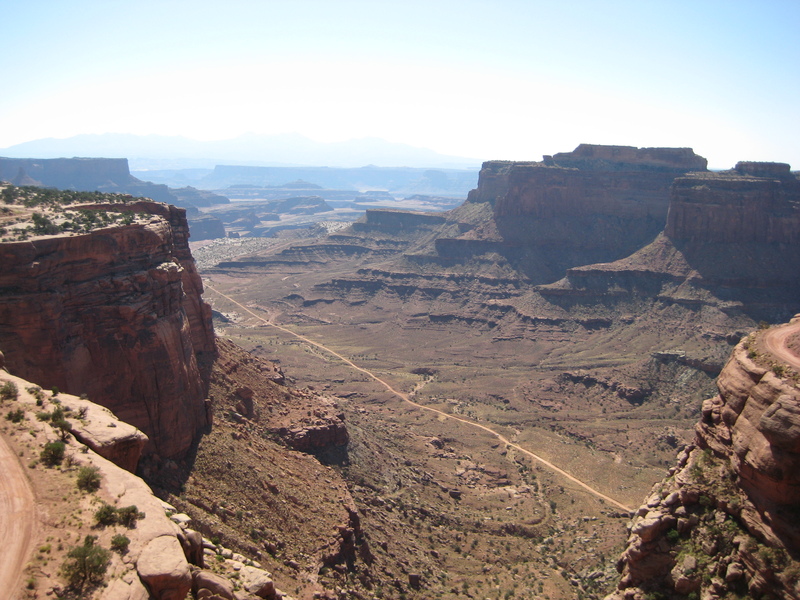 The official Canyonlands National Park and Moab Area Travel Council Web sites claim that the pavement in this part of the park is about 20 miles long. This is exceedingly misleading. The gate is 20 miles from US 191! 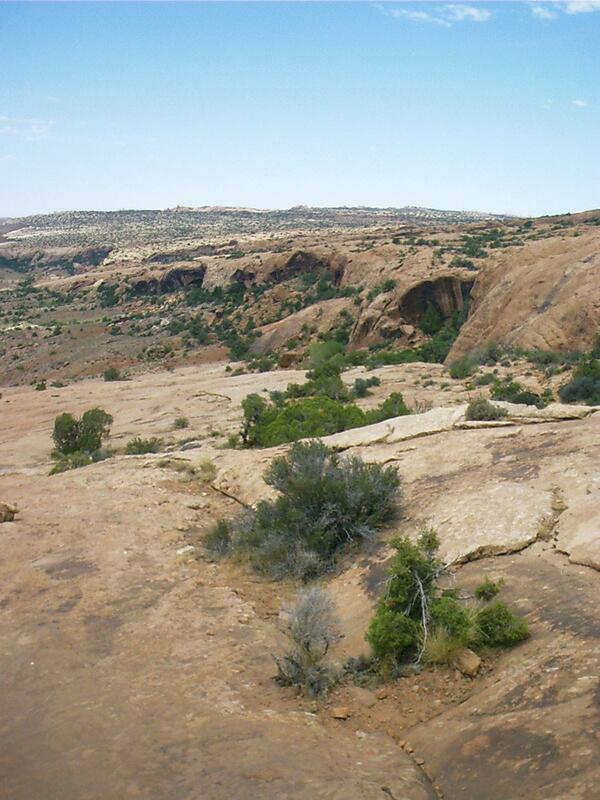 In fact the end of the paved road is nearly 50 miles from Moab. Riding a motorcycle all the way in and all the way back out should not be attempted, starting with anything less than a full tank of fuel. The unpaved path all the way down at the bottom is the South Fork Road, which is another way back to Moab. To hear talk, getting down there from the Island in the Sky Visitor Center is the easy part. 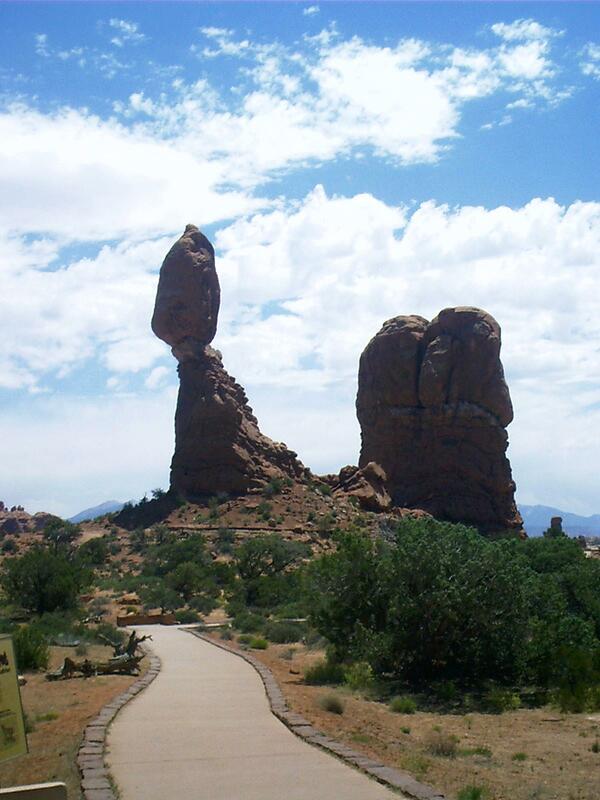 These formations are called the Monitor and the Merrimac for their resemblance to the Civil War iron-clad battleships. 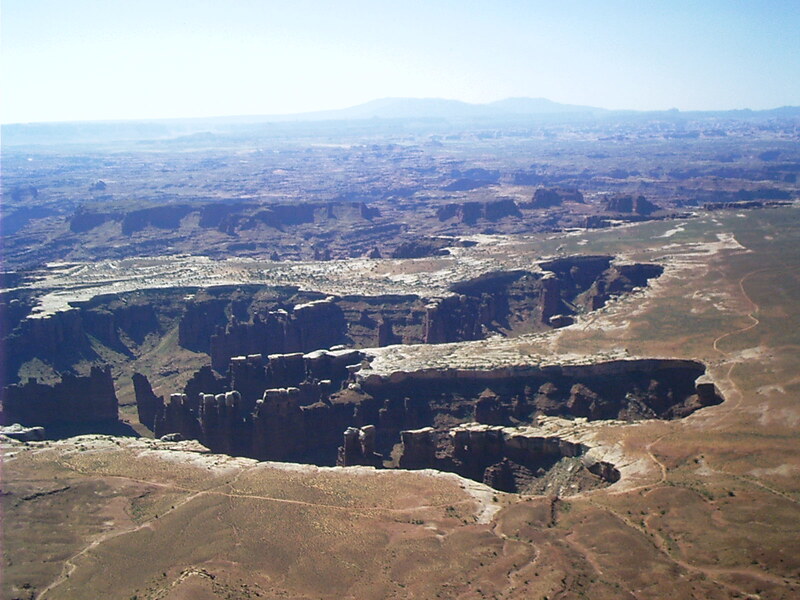 This is Junction Butte, the southernmost tip of the Wingate formation above the confluence of the Green River with the Colorado River in Canyonlands National Park. 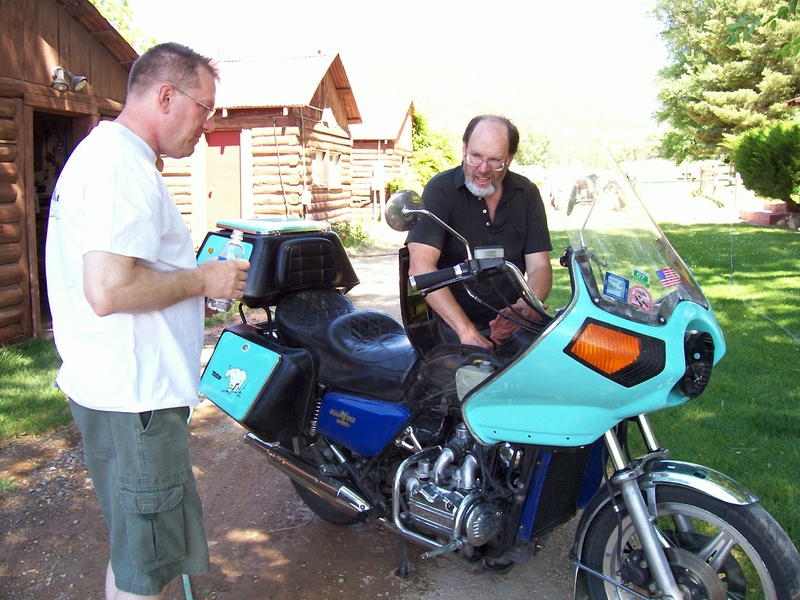 Geraldine, my 1979 GL1000 Honda Goldwing, had been acting up since I hit I-80 in southwestern Wyoming. She seemed to starve for fuel in at least one cylinder at speeds over 60 mph. and was growing worse. Nobody was going anywhere in the heat of the afternoon, so I took the carburetor rack off to see what could be the matter. The #2 float-valve screen was plugged up with silicone sealant that I had used to join the halves of the plenum the last time I cleaned the carbs. I removed the obstruction and reassembled the bike with the able assistance of Mark Olson. On our second full and final day in Moab, Bryan Wooten agreed to guide Lyle Gunderson and me up the Delicate Arch Trail in Arches National Park. 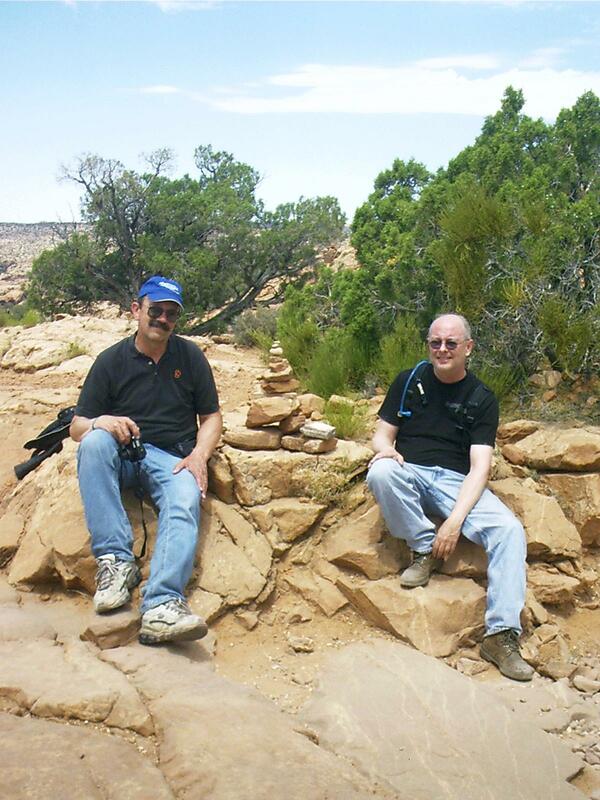 This is Balanced Rock, which is beside the access road. "Disabled Civil War veteran John Wesley Wolfe and his son Fred settled here in the late 1800s. 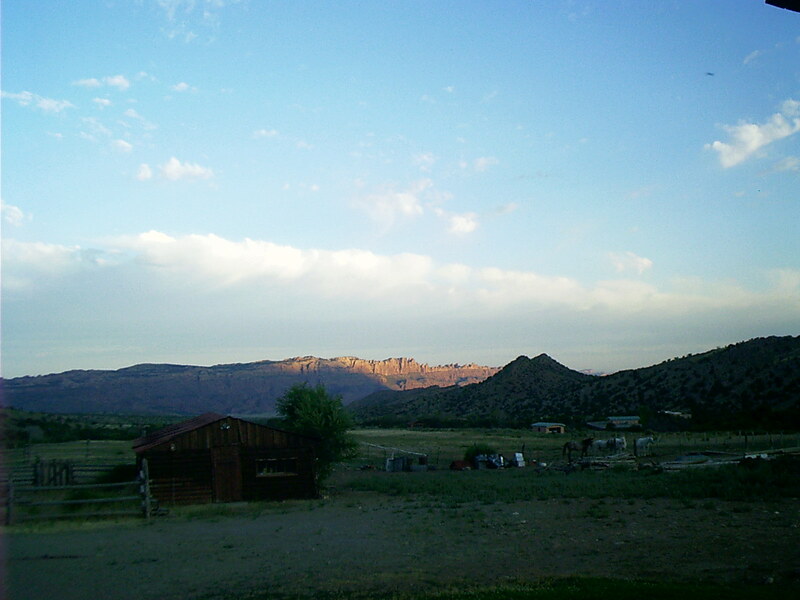 A weathered log cabin, root cellar, and corral give evidence of the primitive ranch they operated for over 20 years." • United States. Dept. of the Interior. National Park Service. Arches National Park. Washington, DC: GPO, 2007. 330-358/00618. The trail to Delicate Arch starts from the parking lot at Wolfe Ranch. The National Park Service rates it "moderately strenuous." It is three miles long (six miles round trip) and climbs nearly 500 feet across the "slick rock." Take a quart of water, and don't drink it all at once. We started early. Pictured here are Lyle and Bryan, both still in fine fettle. Fortunately for us, we picked a partially overcast day to do this. 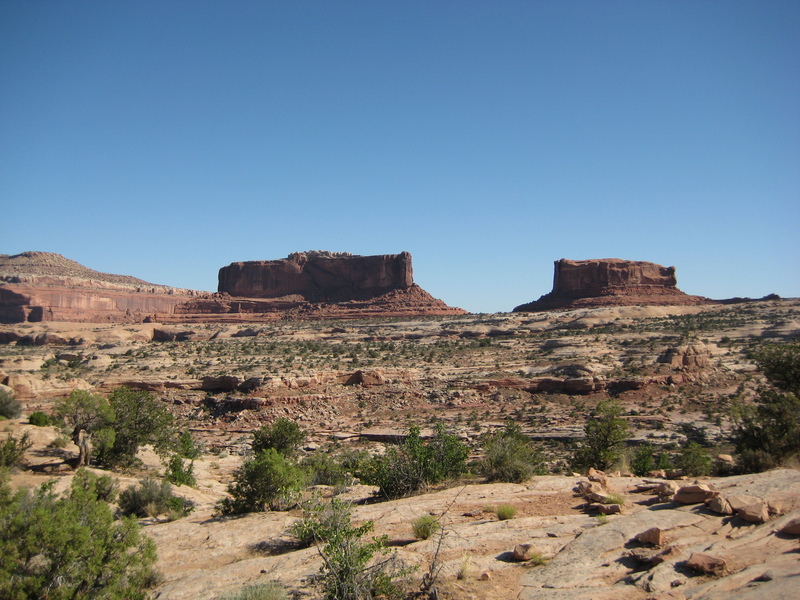 "Except for isolated remnants, today's major formations are salmon-colored Entrada Sandstone, in which most arches form, and buff-colored Navajo Sandstone. They stand like a layer cake over most of the park. Over time water seeped into superficial cracks, joints, and folds. Ice formed in the fissures, expanding and pressuring the rock, breaking off bits and pieces. Wind later cleaned out the loose particles, leaving a series of free-standing fins. Wind and water then attacked these fins until the cementing material in some gave way and chunks of rock tumbled out. Many of these damaged fins collapsed. Others, hard enough and balanced, survived despite missing sections. These became the famous arches. Pothole arches are formed by chemical weathering as water collects in natural depressions and then eventually cuts through to the layer below. 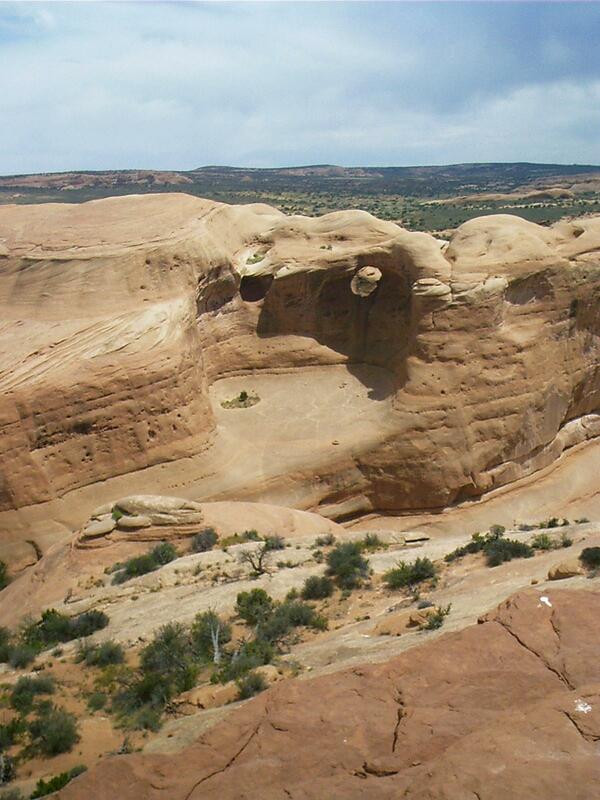 This is the geologic story of Arches National Park — probably. The evidence is largely circumstantial." 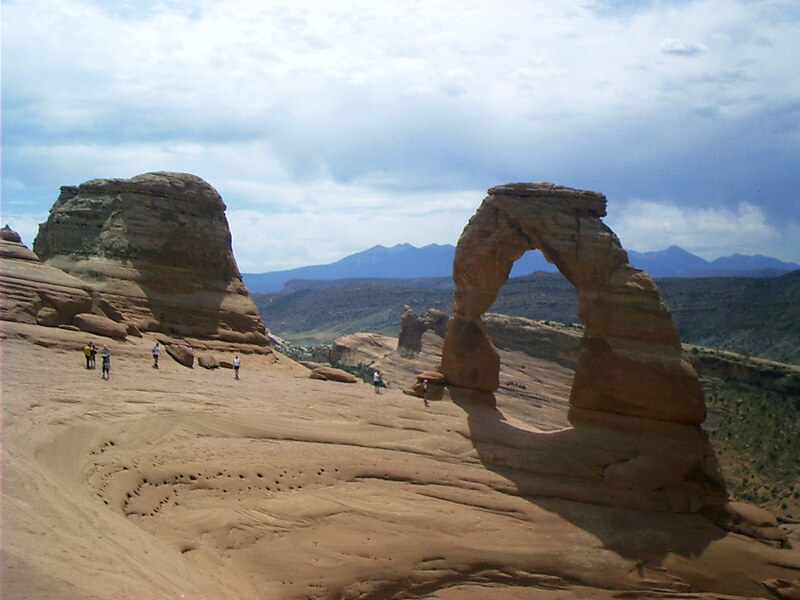 Here is the icon of Arches National Park, the Moab area, and indeed the whole state of Utah. It's huge. Seeing it is worth the climb. Rhode, Chuck. 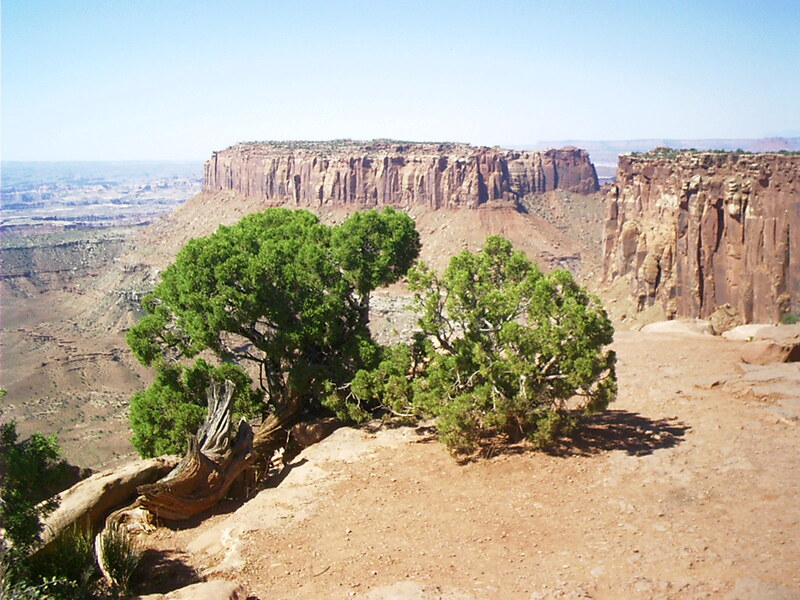 "Moab, UT." The Flat Route. 21 Jul. 2007. Lacus Veris. 24 Apr. 2019 <http://lacusveris.com/Moab/Snaps/Reeky.shtml>. Last modified 4 Oct. 2015. Served 8865 times between 16 May. 2010 and 24 Apr. 2019. Contact mailto:CRhode@LacusVeris.com?subject=The+Flat+Route.